The Jacobean Coat – colour and stitching begins! The second stage, after all those stems, is to start adding colour. I’ve started with the sleeves because they are a bit more manageable than an entire coat, and it gives me a chance to feel my way towards the colour distribution of the stitches over the felt. 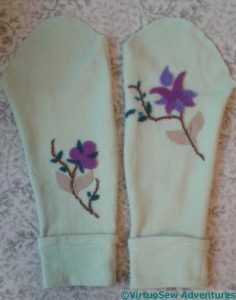 The placement of the motifs is different for each sleeve, one above and one below the elbow, and it isn’t even the same motif. Repetition is overrated! 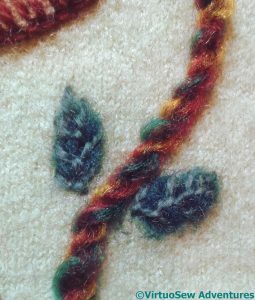 I think I will probably settle on using feather stitch over the felt for these tiny leaves, which are scattered throughout the design. The rest of it is going to be a riot of stitches and stitch combinations, so this will provide a moment of rest in embroidery, a moment of reassuring similarity from which the exuberance can take flight. It will also give me something to be doing if inspiration fails for any of the motifs! One of the things I have learnt, over the years, about working on these large projects that involves making it up as I go along, is that there needs to be something useful to do while the next bit is being mulled over – it reduces the pressure and gives space for the mind to wander over new and interesting stitch choices. The feather-stitched leaves are perfect. No further complication needed there! I know exactly what you mean about needing to leave a straightforward bit to get on with while thinking (also useful for stitching where deep concentration is not an option) I often leave the ‘second half’ of something for stitching in company, on journeys and in waiting rooms. I can just get on with it. But that also lets me think about the next stage if I get the chance. Otherwise there is always the bath or an early Sunday morning pondering session. I am eager to see the next stage of the coat and find out what happens next…. Ooo – those flowers are delightful. I love this piece Rachel! And I do the same with my larger projects. I jump around a bit when I get stuck. Or when things get boring :). Pretty work Rachel, I like that the motifs are different and differently placed on each sleeve. Such an exciting piece, and I love your frugality. In all pieces I agree that it is nice to have something to do that involves little thought! Your work is so delicate. How lovely to include some family “heirloom” in this project! Beautiful work. 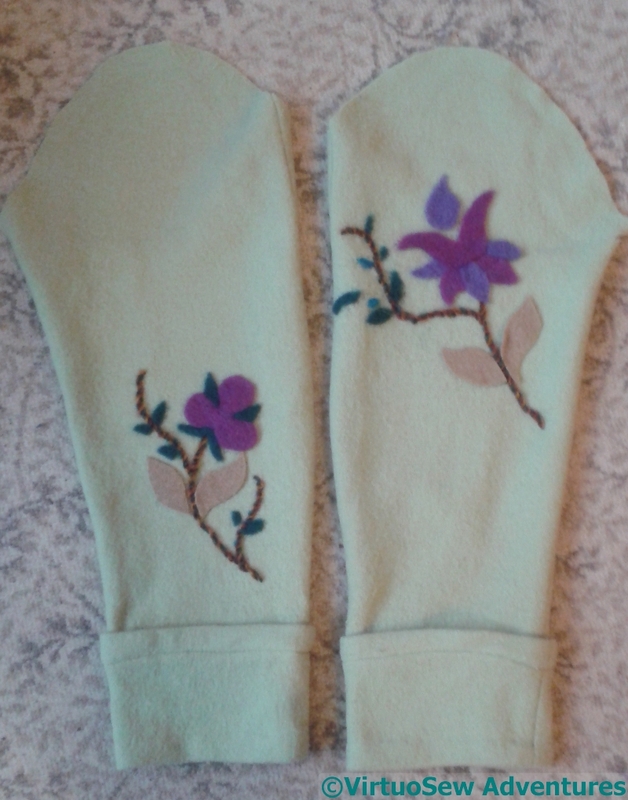 That feather stitch for the leaves is perfect and I also like the different placement of the motifs on the sleeves. Your last paragraph really resonates with me. Sometimes when I’m stuck on a seam, I just go on to another one and let it percolate. Eventually, I know what more needs to be done. I don’t know for sure, but I think the nice greenness of the background is coming out in this photography of the sleeves. It may not be exact, but it gives a good idea. I just love that you used your grandfather’s old sweater on this!